Who is Orange County Pools? Mike Brunning, President of Orange County Pools has been in the pool industry for over 3 decades. All jobs are owner supervised with only experienced and competent personnel on site at all times. Our goal is to design and build the most luxurious, state-of-the-art, quality-built pools and spas without exploiting our customer's budget. Call us today for a free quote. It's appearance, reflections, and how it refracts light and color. By adding a vertical element of moving water, the design can spring to life and almost become a work of art. There are many types of water features to choose from, and the effects they can create are seemingly infinite when factoring in size, flow rate, acoustics, and lighting. 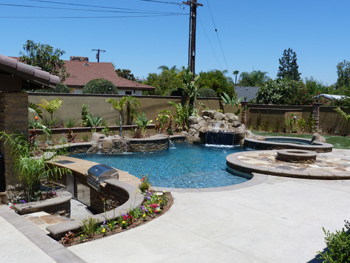 With award winning designs, owner supervision with over 30 years experience, and a commitment to quality, your dream backyard can become a reality.